Experience a bit of the Amish life on this private driving tour from Philadelphia to Lancaster County in Pennsylvania. Select from a 6-, 8-, or 10-hour tour, then travel over country roads while learning about the history, philosophies, and culture of the Amish and Mennonite people. Choose from a variety of activities, including an Amish buggy ride and/or visiting local craft stores and bakeries. Enjoy lunch at a classic Pennsylvania Dutch smorgasbord or market. Philadelphia hotel pickup and drop-off included. This private day tour to Lancaster County begins with a Philadelphia hotel pickup or meet at our local Arch Street office. Choose from a 6-, 8-, or 10-hour tour. Lancaster County is located approximately 90 minutes outside of Philadelphia and has been home to Amish and Mennonite communities for generations. 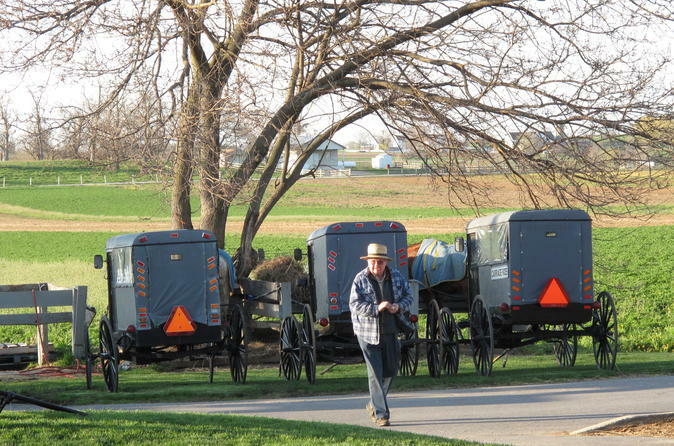 The tour includes a drive along country roads that crisscross the area, while learning about the history, philosophies, and culture of the Amish and Mennonite people from the tour guide. Depending upon the length of the tour, activities for the day may include an Amish buggy ride, visiting a local bakery, and/or touring a museum to see how the Amish have lived for more than two centuries. Enjoy lunch at a classic Pennsylvania Dutch Smorgasbord or market, and check out some of the many local craft and quilt shops for the perfect Amish souvenir. At the end of the day, the tour ends with a return trip to Philadelphia and a hotel drop-off, if applicable.